One or two students in Year Six at Ultimo Public School are chosen each year as winners of the Harris Community Scholarship.To view the letter inviting year 6 students attending Ultimo Public School to apply for the Harris Community Scholarship , click here. 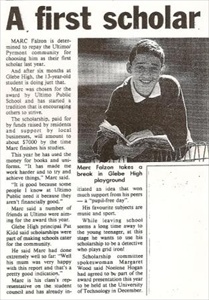 Our first scholar, chosen in 1990 was Marc Falzon who began a tradition that is encouraging others to strive. The scholarship is paid for by funds raised by residents and local businesses and being successful in winning grants over the years from City of Sydney. Students completing high school through to university studies would receive around $5,000 in Scholarship funds each. Marc Falzon completed his studies in 2000.
" it made me work harder and try to achieve things". Over the last 22 years the scholarship has provided funds of $250 -$550 to each of the 32 recipients each year. As the scholarship holders continue their education from year six at Ultimo Public school, they receive HCS Fund financial assistance throughout their secondary and higher education. Every year the scholarship holders are reminded that they were chosen in Year Six because of their community spirit, engaging with the activities and programs at the Ultimo Public School and excelling in their talents. These funds assist students with the purchase of texts, study aids, uniform and extra curricula activities such as Outward Bound programs, pottery and drama, all of which contribute to their educational and personal development.. In 2005, the Harris Scholarship Fund presented "Community Leadership" awards to two TAFE students attending TAFENSW Sydney Institute, Ultimo College. The students received the award for their commitment and achievements in Community Welfare.